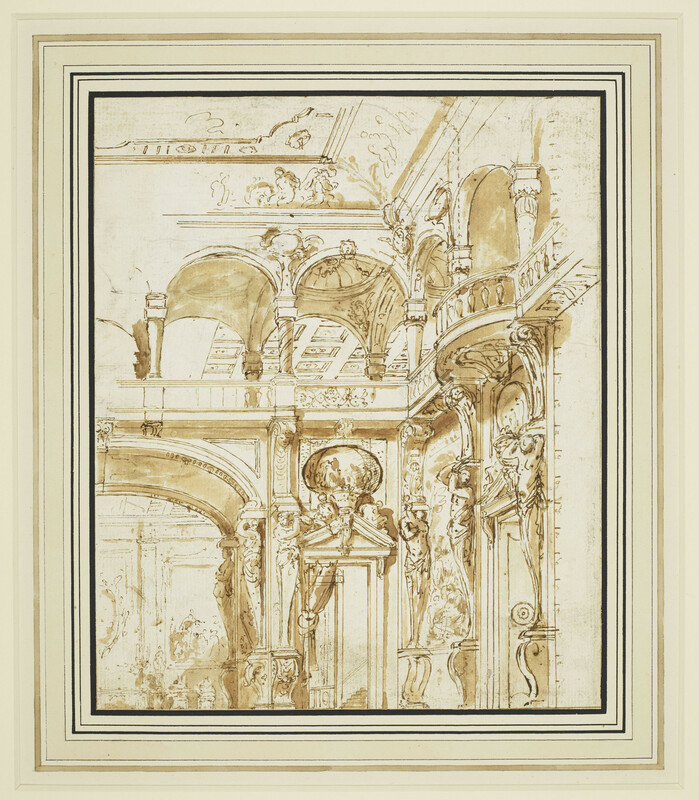 A pen and ink and wash drawing of room with figures supporting a balcony, looking through to a coffered ceiling and room beyond. A scale runs up the right hand side, numbered from 0 to 24, probably in Venetian piedi. Marco Ricci worked as a stage designer with Antonio Pellegrini for Owen McSwiny in England, returning to Venice in 1716. In Venice he designed sets for the Teatro Sant'Angelo, where his uncle Sebastiano Ricci was director, and for the Teatro San Grisostomo. His name appears in libretti for productions in 1718, 1719 and 1726, but the detail is rather scant and it is difficult to identify particular drawings with particular operas. This drawing might represent the 'Galleria magnifica' in Nicola Porpora's Siface (1726), but interiors of baroque palaces were frequently used in stage sets. Joseph Smith, a keen opera lover who was married to the soprano Catherine Tofts, owned 55 of Marco Ricci's drawings for the stage. Stage scenery was temporary and does not survive, so it is difficult to know how the designs would have been translated into sets. The scale in Venetian feet suggests this design was intended to be about 7m high.